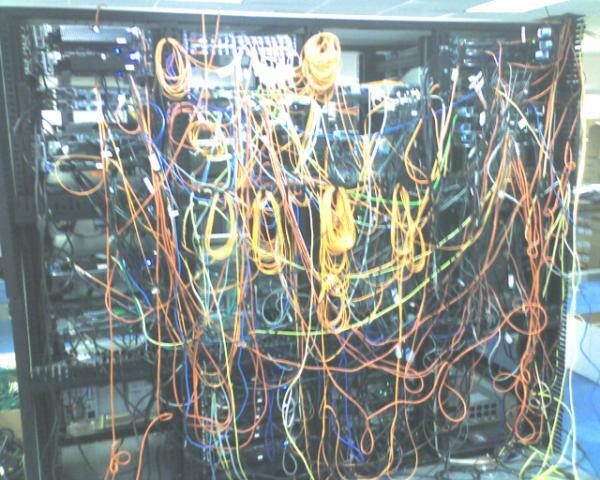 If you were to move to a new office, a green field site, then I would recommend setting up a “structured wiring system”. That is the industry term. It will make setting and maintaining your company's IT system alot easier. Don't take short cuts. 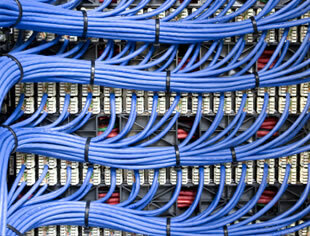 The communications (comms) cabinet forms the central part of the structured cabling system. The cabinet has a rack system that allows for the patch panels and other equipment to be bolted in. The unit should be located carefully. Do not place the unit under any water pipes or any other hazard that may damage the hardware in the room. The room should be ventilated to allow the electrical hardware to remain cool and therefore last longer. Air conditioning should be an option. The area around and in the cabinet should be dust free to prevent fans from clogging up with dirt. Flood your offices with dual or quad wall boxes when you have the chance. Office staff will move, the desks will relocate, and unless you put enough wiring in place, you will find wires trailling all around. 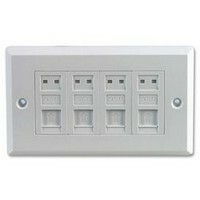 It is bad for the network to put 4 and 8 port switches around the office due to a lack of structured wiring. The two photos above show typical examples of what you might see in a structured cabling system on the walls of an office. 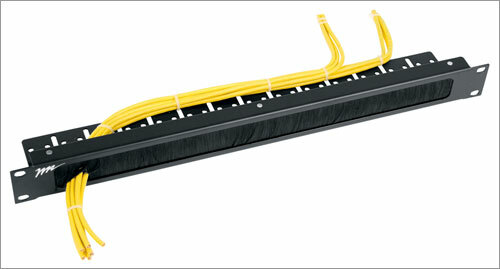 In modern offices, the cabling is hidden under the suspended floor and is accessed via hinged floor plates. The ports from the various office locations are wired back to the central computer room and terminated within the comms cabinet. Termination is the name given to the process of picking out the strands of cable from the core, and pushing each one into the patch panel and rj45 socket. Time should be taken to sort them and wire them to the patch panels. The diagram above shows the back of the patch panels, but where someone has taken the care to tidy and cable tie the batches of cable. The cable tends to be CAT5e which refers the Category 5e. This relates to the standard or type of cable - the number of twists of the pairs of wires sheathed under the outer coating. You can get several colours, as in the blue above, but the most common is a light or dark grey. The front of patch panel looks like the photo above. When you know that, for example, port 5 of the panel needs to be data, you take a "patch lead" and connect port 5 to the appropriate network switch. 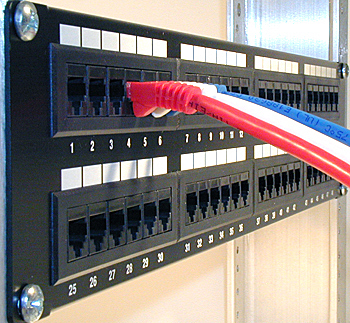 A patch lead is the name given to a short lenth of Cate5e cable, with two ends terminated with clear plastic RJ45 connectors. Often you can use a different colour for data, phones or servers. Colours will help you to workout which lead is for what device - very useful sometimes when troubleshooting. 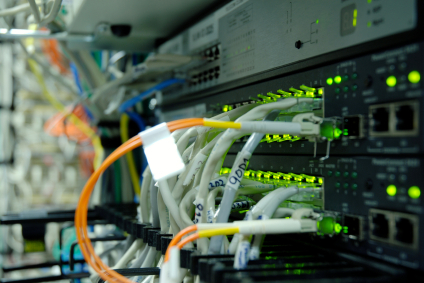 The network devices are bolted into the frame of the wiring cabinet, or sometimes in an adajacent cabinet, depending on the size of your network. There are various plates that can used to keep the patch leads from covering the lights and controls of the devices - very useful when problems occur. Use managed network devices if budget permits. Often with these devices you will get a web interface that will give you reports, even emails and SMS messages, should your network need supporting. You can then get some statistics and trouble shooting information. Buy enough patch leads of the correct colour and length. 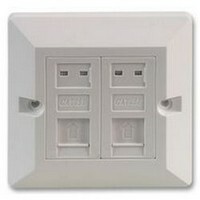 Fit management units amongst the devices and panels. The brush plates are bolted into the cabinets. 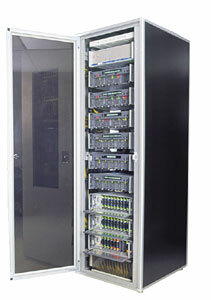 The patch leads can be pushed through easily and then connected into the devices and patch panels. All loose cable is then stored out of sight within the cabinet. Setup computer room/cupboard away from water and other hazards. Use battery backup to smoothe power spikes and give some backup for power outages. Make sure everyting is well ventilated or air cooled to prevent the hardware failing sooner that it would otherwise. Keep the room dust free and keep clean to prevent dust clogging up the server/electronic hardware. Doors/sound proofing able to block the sounds of fans/servers from annoying staff. Label all hardware and special leads - it will help if something fails. Put support contract phone numbers near the kit or lines that are covered. Check the lights and get a feel of what they are doing when things are working well. It will help when things are not - even take some photos for reference. Make sure you put cabinets where you can access ALL sides - very useful in times of trouble and strife. Make sure you disable any network ports not in use - it will stop hackers coming in and plugging their kit into spare office ports. Lock the door of the computer room. Setup a camera to record who goes in the room - low cost with an old PC running and storing the video with a time stamp. Pick a room with no windows. Brick up your windows, or place heavy duty bars in them. One way mirror the windows so no-one can see in. Restrict access to a few trusted staff via a lock or combination lock. Place appropriate fire extinguishers that will not damage all the hardware - consider putting an inergen or other inert gas system into the room if the risk/value warrants the expense.